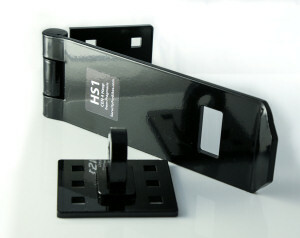 If you intend to lock a building, a shed or a cabinet, you are likely to need a hasp & staple. A hasp and staple is used in combination with a padlock. You should also check the security of the hinges for the shed door. The products mentioned below are listed in our online shop. A hasp & staple comprises a hinged hasp that is typically fitted to the side of a door, and a loop on a plate (the staple) that is fitted to the surrounding structure/doorframe and that is protected by the hinged plate of the hasp when secured. There are many of these hasps on the market, and most are very poor and are easy targets for a thief! This is one of the key reasons why shed crime is on the increase: Shed doors are generally not properly protected! A good hasp will have fixings that are concealed for both sides! Sometimes, the fixings are concealed on the staple but exposed for the hasp - Doh! To be protected, they both need to be concealed! A good hasp will allow you to use a closed shackle padlock, as an open shackle padlock will surely be a target for a thief! We designed our HS1 Heavy Duty Hasp & Staple to include all of the above features, and more, as we wanted it to be better than any comparable-priced hasp on the market. The photo above shows the main components of the HS1 without its fitting kit. The HS1 hasp is more expensive than budget hasps, but modest investments to keep thieves out of your shed can be the best investments of all! We also offer it in a Package Deal with a recommended Squire SS50CS padlock, at a bargain price! A good hasp & staple and a good padlock can give good security to that side of a shed door or to the middle of double doors, but it is of little benefit unless the hinges are also of good quality and properly fitted. It is unusual that thieves exploit the hinges themselves, but the fixing of the hinges is another very common target for thieves. Again, just having wood screws leaves them easy for a thief to rip out of the wood and to gain rapid entry by opening the door the wrong way round. It is crucial that both sides of every hinge are bolted-through, with nuts on the inside of the shed, to avoid allowing the thief such easy opportunities to gain entry to the shed. And the thicker the metal, the better! It is usually difficult for a thief to saw through hinges as they are right against the wood, but avoiding realy thin metal has to help improve the deterrent effect. If you have hinges that are simply held in position with wood screws and no coach bolts, our Beef-Up Kit may help as it provides a selection of bolts etc to help you bolt right through the door and frame such that it is no longer a case of just pulling out some wood screws with a crowbar. There is more explanation on the Beef-Up Kit page.